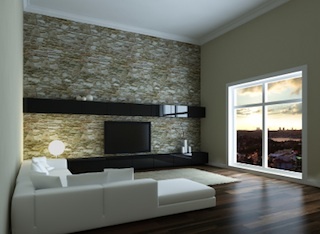 Custom hardwood floors, what is custom about hardwood floors? What is considered custom? Is it a border? No, anyone can purchase borders, premade designs and just install them - easy. Is it a medallion? No, these are made on a cnc machine, again, anyone can purchase these same designs and install them - easy. Mix materials? ehhh, still can be duplicated by anyone - still easy. Although, many will consider these above designs custom. They can be easily duplicated, therefore it wouldn't be custom. Simply, because it wouldn't be unique or one of a kind. The point of having a custom made hardwood floors, is so no else, will have the same wood flooring as you. Because they're unique and one of a kind, that's bragging rights for anyone who owns a custom hardwood floor. 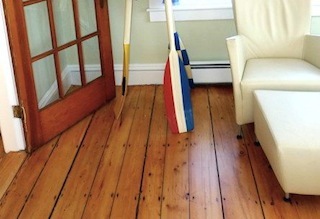 So, what is custom hardwood floors? Well, if you can find a rare wood specie that no one can get their hands on, and have wood flooring made, that's a custom hardwood floor. If, you can have some insane border design custom made, like your name in five different wood specie with diamond inserts. Yeah, that's custom hardwood floors. And how about a medallion, that has your own image in five different wood species, with some bling. You would probably like that. 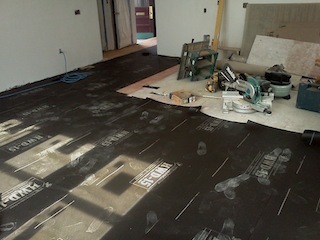 I think your starting to get the picture of what custom made hardwood floors are. It's something no else will have, not because they can't afford it. But rather they won't think of it. In this article, I will explain how to design, layout and construct a custom curved hardwood border, Along with pictures of custom hardwood floors from our project. If, you want any of the above ideas, you'll have to send it out to a CnC shop, so they can put it on a Cad/Cam system. Too much for me to cover here, how to use Cad/Cam, setting up and operating Cnc's, so back to the article. Material to make jig for arc, this can cardboard cut to 3"x40" strips, 3"x40"luan strips, or plywood. Start by laying out your underlayment or vapor barrier. Staple the ends down, so they don't get in the way or shift on you, while you're trying to lay out your design. 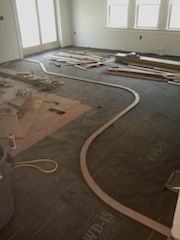 Once the underlayment is in place, begin to layout your curve. Don't worry it doesn't have to be perfect. You just need to position and see how big of a curved border you would like. 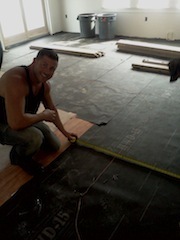 In this photo, Mark from BB Unique Remodeling is here to finalize size and location of the custom hardwood floor curved border. We had to put in consideration of cabinets and furniture locations, so do the same when your laying out your custom made hardwood floors design. Once you have your locations figured out, use the builders string to layout your curves. Move and adjust the strings as needed, until you get a layout that is visually comfortable to you. 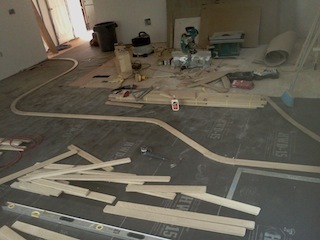 Now, that you have your rough custom hardwood floors curved layout. It's time to draw in a hard layout. Start with simple lines, lines should be parallel and straight. Use your tape measure and straight edge to do this. 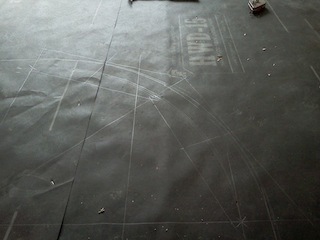 Once, you have your lines in place, it's time to find the center points for your arcs. Using a tape measure, measure from the end point of the arc to the center, to get your radius value, be sure to measure from both end points. Round off your measurement to the nearest inch or feet. Keep your numbers simple, use measurements at 1, 1 1/2, 2, 2 1/2, 3, 3 1/2 ft. etc. This will help you with your addition and subtraction, keeping them simpler to figure out. Once you have a radius value, using the framing sq. measure from the end point to the center, measure from both endpoints. The intersecting point is your center point for your radius, place a nail here. 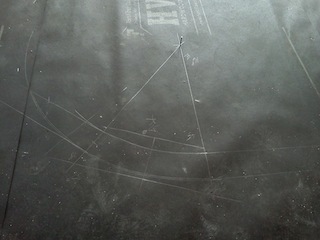 Draw and arc using your chalkline anchored to the nail, make a rough drawing of the arc. 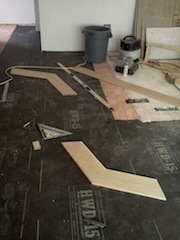 After, you have drawn in your arc for your custom hardwood floor border design. Decide how many segments, you will need to create the arc. For example on a full corner radius, with arc swinging from a horizontal line to a vertical line. If, you want this to be 2 segment or 2 piece, then divide 90/2 = 45 degree, you'll need cut 2 pieces, with side angles at 22 1/2 degrees. For a 3 segmented arc or 3 pieces, it would be 90/3 = 30 degrees, you'll need to cut 3 pieces with side angles at 15 degrees. The number of segment or pieces needed will be determined by the width of your border, stock size, and size of arc. On our project we decided on a 2 piece arc, so our angle was 45 degrees with 22 1/2 degree per side. 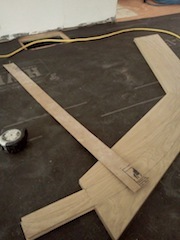 Next, we need to figure out, our stock width, for our custom hardwood floors curved piece. Fortunately, we only have to figure out dimensions for only, one segmented piece, the second piece will be the same, a mirror. Start by drawing a line from midpoint(Id -inside diameter) to midpoint(Od - outside diameter) on your arc. Extend the line pass the Od by 1/2", using a framing sq., draw a perpendicular line, the width of the arc. 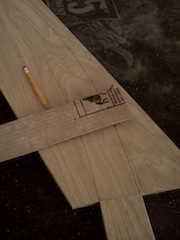 Offset the line, to the endpoint of the Id of the arc, add and additional 1/2". You now, have a Length and Width dimension, for your segment of your arc. Cut your pieces out and do a dry layout. As long as all your figures are correct, you'll end up with an pieces, with the length to size and the width will be oversized. Using a strip of 3"x 40" material, in this photo, I used a piece of cardboard, that was waste. You can use any type of material, improvise, if possible. Create a story stick, template to draw your arc. You should have a hole for the center point and holes for your Id and Od. 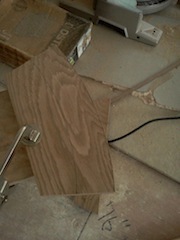 With the hardwood stock in place, draw your arcs, onto the material. Be sure that your lines are visible. Using your jig-saw, cut out your arc, leaving it 1/16" or more, oversized. Using your belt sander, sand your arc into dimension, check the cut side for squareness to the top surface. Check the width, to make sure there within tolerance and at the width you want. 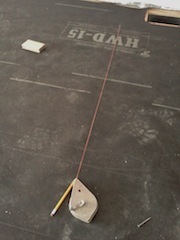 Our arc was cut to 2 1/4", the same width as our flooring. By doing this, we saved ourselves work from having to create the straight boards. Once all your pieces are fabricated, dry fit the pieces, make sure they fit properly and the width is continuous from start to finish. Once satisfied, nail in your arcs first, then your straight boards. 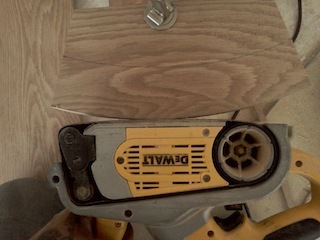 Use a finish nailer, to face nail them in place. 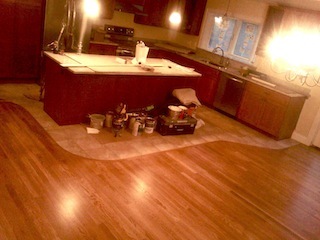 You've now created a one of a kind hardwood floor design, a custom hardwood floors border. You can say you have custom hardwood floors made. If, you can build one of these, you'll be able to build anything. You can add custom inlays to bring the design to another level. Unlock your abilities, you have more capabilities, then you know. G and S wood floors Lynn,Ma.